Now there’s a toilet that allows you to go anywhere you go. Introducing the PolyJohn Mini-Flush™, a self-contained flushing toilet system suited for use in small spaces. Think temporary offices, tool cribs, lunch trailers, railroad cars, buses, boats, mines and similar applications where a complete portable toilet simply won’t fit. At only 23” wide, the Mini-Flush™ will even go through narrow closet door openings. In other words, if you can fit, it can fit. 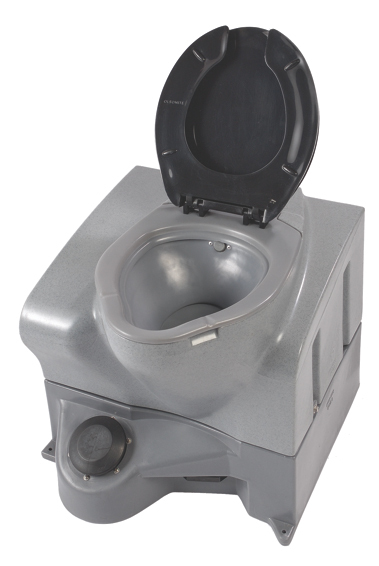 The Mini-Flush™ is also more comfortable than other temporary toilets. Sitting at a full 21 ½” high and molded to the same seat dimensions as a household unit, it’s nearly impossible not to feel at home. You may even want to keep it around long-term. Semi-permanent options along with traditional temporary installations are available when plumbed to a waste storage tank. With only two moving parts, the Mini-Flush™ toilet is easy to wipe, clean and service. Visit us at www.polyjohn.com or call 800-292-1305. More Space for Maximum Comfort. The PolyJohn Fleet flush restroom offers 25% more interior space than other units in its class. More space means more comfort for moms with young children, construction workers with bulky tool belts or users attired in formal wear. It’s a versatile and attractive option for any high-end construction project or VIP event requiring a better experience. even solar lighting – fit nicely and appeal to multiple markets. The Fleet offers a full flush range, including recirculating flush, fresh-water flush and a variety of units that tie into city mains. The stylish European design is aerodynamic, durable and easy to service and clean, and it’s made by PolyJohn, a world-class manufacturer of durable portable restrooms. Visit us at www.polyjohn.com or call 800-292-1305. Made by PolyJohn and known as the “Workhorse” of the industry, the PJN3 is ideal for any outdoor restroom need. The PJN3 has a spacious interior and a translucent roof. No more dark porta-potties. Other highlights include anti-slip floors, maximum ventilation, a two-roll paper dispenser, and an occupancy signal latch. Options include a hand washing sink or hand sanitizing dispenser, convenience shelf with hook, locking kit, and gender signs. The advanced waste tank design makes cleaning and servicing easy. Each unit comes with a door-mounted mirror, handle, and a non-splash urinal. The PJN3 is available in the standard static tank model or with the optional recirculating flush tank. The PJN3 is made by PolyJohn, the leading manufacturer of high-quality portable sanitation products. Visit us at www.polyjohn.com or call 800-292-1305. Wherever there’s a need for a job site trailer, there’s also a need for a PolyJohn holding tank. The holding tank is a durable, sanitary receptacle used for collecting waste in portable restrooms. It’s an absolute necessity for long-term portable sites where indoor plumbing is not an option. Made from highly durable plastic, the holding tank design is functional and discreet. It’s also compatible with other PolyJohn restrooms and sinks, and can be easily configured with most any type of plumbing. For outdoor work sites or special events, use the holding tank to complete any portable restroom area. 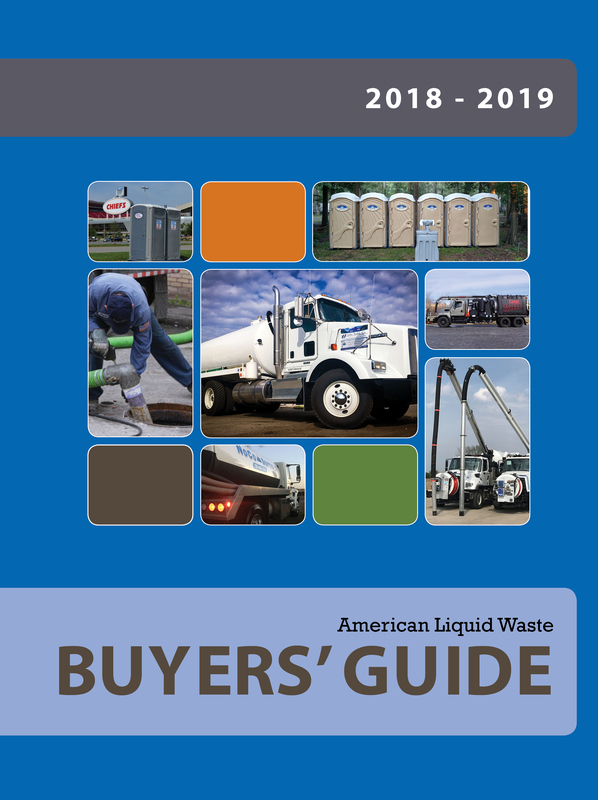 The tanks are available in 250-gallon and 300-gallon capacities for maximum waste storage. Wherever there’s a need for a job site trailer, remember the holding tank. Best of all, it’s made by PolyJohn, the leading manufacturer of high-quality portable sanitation products. Visit us at polyjohn.com or call 800.292.1305. The PolyJohn WaterWorks™ Fresh Water Delivery system uses an on-demand electrical pump to deliver up to 93 gallons of fresh water whenever it’s needed. It works wherever people work, including office trailers, food service trailers, tool cribs and lunchrooms. The system is also the perfect accessory to portable showers, sinks and fresh-water portable flush toilets. A semi-transparent tank allows users to see how much water is available. And if an event requires more than 93 gallons, an auxiliary holding tank can be added for double capacity – no problem. The complete system weighs only 46 pounds empty, which means transporting it to a site is a one-person job. It measures 60” high and 23” wide and fits nicely inside the smallest closet. The system can also be plumbed to fill from the outside of a trailer. For gray water storage, 250- or 300-gallon tanks are available. Cleaning the inside of the tank is easy because of the 10” diameter access cover on top, and water can be drained quickly through a 1” valve. The WaterWorks Fresh Water Deliver system is designed to operate on regular household current, and the circuits are protected by GFCI and a low-water electrical shut-off. For water delivery that works when it’s needed, wherever it’s needed, the WaterWorks Fresh Water Delivery system is a smart choice. It’s made by PolyJohn, one of the leading manufacturers of high-quality portable sanitation products. Visit us at www.polyjohn.com or call 800-292-1305. 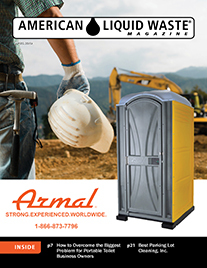 The Armal transport dolly is the “operator’s partner” when moving the WAVE portable toilet from one location to another. FEATURES & BENEFITS: The Wave transport dolly is made of aluminum, so it is light-weight and compact making it easy for one operator to maneuver the portable toilet quickly and effectively. The dolly is made for rigorous daily use. 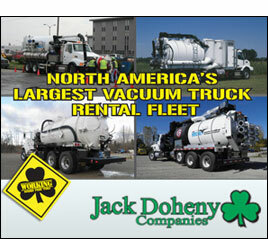 It actually speeds up the process of picking up and/or dropping off portable toilets in a safe and efficient manner. The Scent Box from Armal incorporates one of five fragrances — Vanilla Balm, Rose Sensations, Apple Blossom, Pinewood Trail and Strawberry Field — into the wall panels of the restroom during the manufacturing process, ensuring a pleasant scent inside. Features include heavy-duty, spring-coil doors with a wind-resistant device to ensure closure when unlocked, overlapping wall assembly for greater safety. Options include a recirculating kit with filter and freshwater flush that works in combination with the pump kit. For more information: 866/873-7796; www.armal.biz.